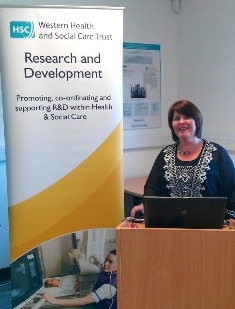 HSC Innovations in conjunction with the Western Health and Social Care Trust (WHSCT) Research and Development Office and the Clinical Translational Research and Innovation Centre (C-TRIC) recently delivered a workshop on ‘Support for Ideas to Improve Patient Care’ for members of staff in the Western Health and Social Care Trust. 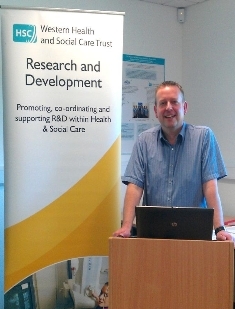 Dr Maurice O’Kane, Director for Research and Development, WHSCT, welcomed the attendees and outlined the importance of research, development and innovation within the WHSCT. 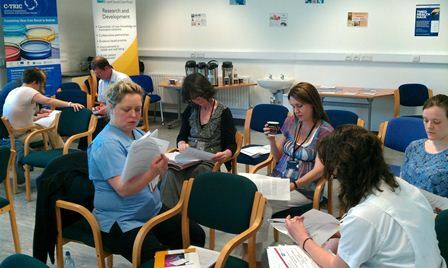 The attendees represented a wide range of clinical areas, and were able to learn about the research and innovation support available to them for developing their ideas to provide a solution to improve patient care. David Brownlee from HSC Innovations presented an overview on intellectual property (IP) within a healthcare setting. This included the areas of what is IP, the value of IP that arises from research and clinical practice and the policy relating to it. There was also an audio-visual clip demonstrating examples of global healthcare innovations from the clinical and research base, in addition to local examples of healthcare innovation such as the world’s first portable cardiac defibrillator (see ‘The World’s First Mobile Defibrillator’ here). The attendees also split into groups for an interactive healthcare case study on IP and developing ideas to improve patient care, prior to a comprehensive summary of the support available to researchers and clinicians from HSC Innovations, and what you should do if you have an idea or a potential solution for an unmet healthcare need. Barry Henderson, Business Development Manager, C-TRIC, then finished the workshop with a summary on the support and services available from C-TRIC, in particular links with academia and business. Barry also highlighted the C-TRIC managed programmes which are aimed at encouraging healthcare innovation. These included Bioentrepreneur and TMED Health Challenge. Further information on these programmes can be found on the C-TRIC website. Dr O’Kane said he hoped the presentations from Sally Doherty, Dr David Brownlee and Barry Henderson would encourage staff to submit their innovative ideas which could be further developed for the benefit of patients, clients, and staff and overall improve the quality of service provided throughout the trust. Other workshops will be delivered over the coming months, so please check the events section of our website for details.